The Goddess of Food or the Goddess of Nourishment (Anna means food and Poorna means complete or full), Mata Parvati. always protects and bless Her devotees with food and prosperity. Annacoot festival is celebrated in India every year after Deepavali. Annapoorna temple has a huge crowd of pilgrims on the occasion of Annacoot. Mountains of fruits, sweets and cereals are laid out before the Goddess and then distributed to the poor. Coins are distributed as Prasad to all the devotees; it is considered that whoever worship this coin will be blessed with successful and prosperous life. A highlight of the temple is that every year, the day before Deepavali, the golden idol of Sri Annapoorna is opened for darshan. This idol can be seen only on that day and it is indeed a great sight. Goddess Sri Annapoorna sits in the middle with her bowl and ladle. On her left is Goddess Sri Lakshmi and on Her right is Sri Bhudevi. All these idols are pure gold and are beautiful looking at. In front of them stands Shiva, made of silver asking for alms. Goddess Sri Annapoorna later goes out on a procession in chariot made of laddus. 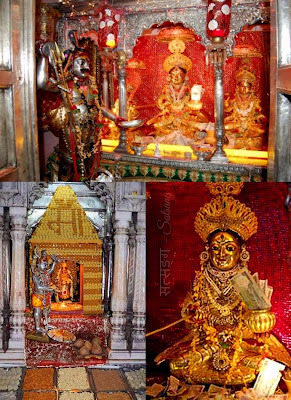 Sri Annapoorna temple is situated at Dashashwamedh road, Vishwanath gali and close to the Kashi Vishwanath temple in Varanasi. [You are] the bestower of eternal happiness, giver of boons and fearlessness, ocean of beauty, purifier of all terrible sins, verily the consort of Shiva, one who purified the lineage of Himalaya, supreme Deity of the city of Kashi, provider of the support of compassion, Mother Annapoorna, the supreme Deity. Give me alms. [You are] wearing brilliant ornaments of various gems, adorned with gold (laced) clothes, one whose space between the breasts shines the elongated necklace of pearls, perfumed with saffron and agar, the cause of splendor, supreme Deity of the city of Kashi, provider of the support of compassion, Mother Annapoorna, the supreme Deity, give me alms. Giver of the bliss of yoga, destroyer of the enemies, giver of the steadiness to dharma, one who is like the waves of the beams of light of moon, sun and fire, preserver of the three worlds, provider of all powers and desires, supreme Deity of the city of Kashi, provider of the support of compassion, Mother Annapoorna, the supreme Deity, give me alms. Mother Annapoorna, the supreme Deity, the supreme Deity of city of Kashi, residing in the caves of Mount Kailash, Gauri, Uma, verily, the consort of Shankara, (ever) youthful, one who makes us understand the meaning of Vedas, one who is of the form of bija mantra OM, one who breaks the door panel to emancipation, one who provides the support of compassion, give me alms. Mother Annapoorna, the supreme Deity, provider of the support of compassion, the supreme Deity of Kashi, you purify the many visible and invisible objects, you carry the treasure of the universe in your womb, destroyer of the sporting play (of the world), the igniter of the lamp of knowledge, you make Shiva happy, give me alms. Mother Annapoorna, (you are) the supreme Deity, the mistress of all the people of earth, (you) are the Goddress, Mother, the Supreme mistress Annapoorna, you carry your braided lock of hair which is like the sapphire, you are always the mistress who is the giver of food, always the giver of bliss, always auspicious. You are the supreme Deity of Kashi, provider of the support of compassion. Give me alms. Mother Annapoorna, you are descriptive of everything that is described by all the letters, you are the origin of the three states of Shiva, you are of the color of saffron, the mistress of the three kinds of creatures, you are one with three waves of creation, preservation and destruction. You are the eternal cause, of the form of darkness, the generator of desires, the cause of the rise of men. You are the supreme Deity of the city of Kashi, the provider of the support of compassion. Give me alms. Mother Annapoorna, you are the supreme Deity, you hold a spoon studded with gold and manifold gems in your right hand and in your left hand you hold a pot with (thickened) milk, you are the ordainer of fortune, the doer of desired things for the devotees, the doer of auspicious things just by casting your glance, you are the supreme Deity of the city of Kashi, the provider of the support of compassion. Please give me alms. Mother Annapoorna, the provider of the support of compassion, the supreme Deity of Kashi, you are like crores and crores of moons, suns and fires, you are the holder of the disk of the rays of the moon, you are wearing earrings like moon, sun and fire, you are of the color of moon and sun, you bear rosary, book, noose along with a goad, give me alms. Protectress of wealth, great giver of fearlessness, Mother, ocean of compassion, verily the provider of liberation, always the doer of auspicious, the mistress of the world, bearer of forgone, the cause of lamenting of Daksha, provider of freedom from illness, the supreme Deity of the city of Kashi, provider of the support of compassion, Annapoorna, give me alms. O Annapoorna, O always fulfilled one, O the beloved of Shiva, O Parvati, give me knowledge, dispassion and perfection as alms. And (my) mother is Devi Parvati, father is the Supreme Lord God, the devotees of Shiva are my relatives and the three worlds are my native place.